Weddings can go by in a blur! Along with photos and videos, you’ll want some wedding souvenirs you can take home and cherish for a lifetime. 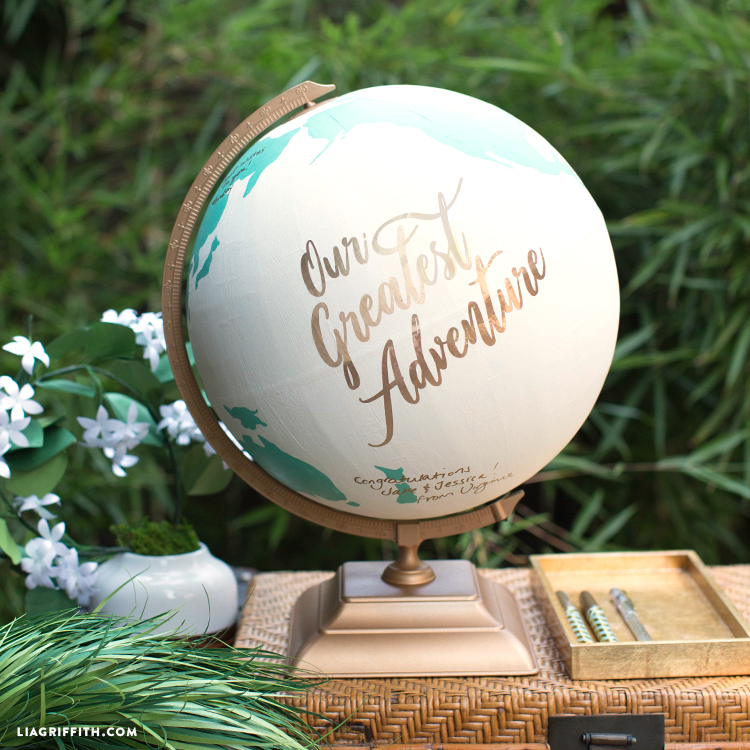 This DIY globe guest book is a unique way to create some wedding memories you’ll always remember. You can have guests sign their names based on the location of their hometown, their favorite place to travel to, or the country they’ve always wanted to see. 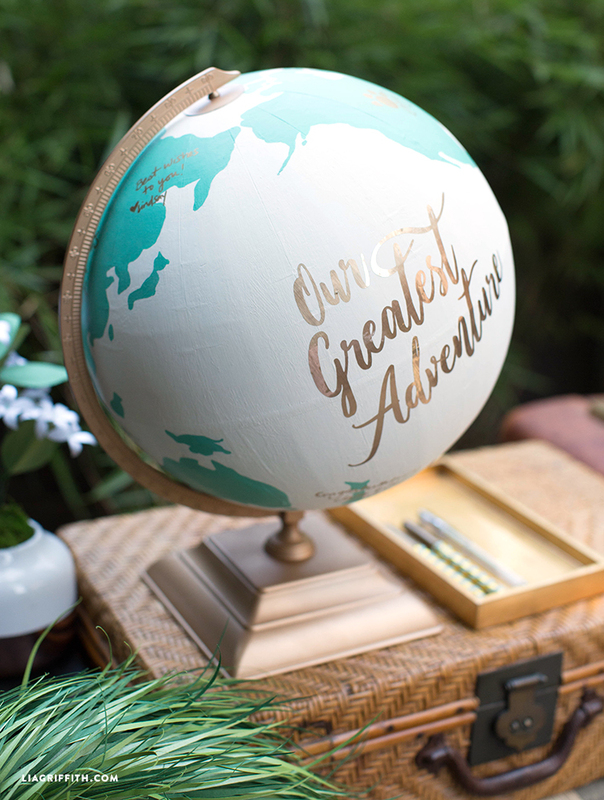 This globe guest book is especially perfect if you’re planning a DIY wedding, a travel-themed wedding, or a destination wedding. For more travel-themed wedding ideas, check out our DIY photo booth props. These two craft projects are a simple way to make your wedding more personal and meaningful. 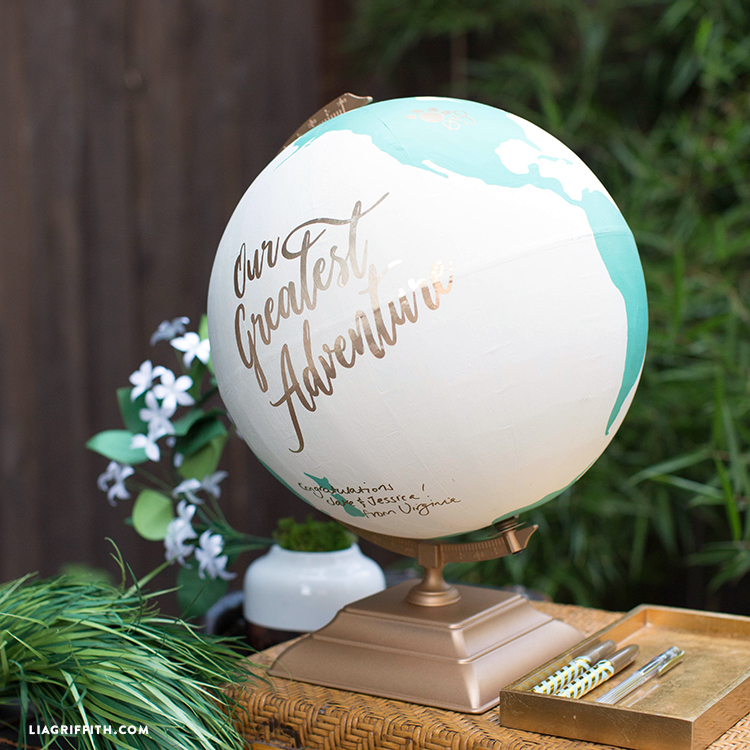 Our designer Krista hand-painted this globe wedding guest book for our own digital marketing analyst and world traveler, Jessica, and her soon-to-be husband, Jake. If you look closely at the pictures, you can see a few well-wishes from the team! If you’re planning a wedding right now (congrats! ), we know how busy you are. The good news is that this DIY project doesn’t take long at all. 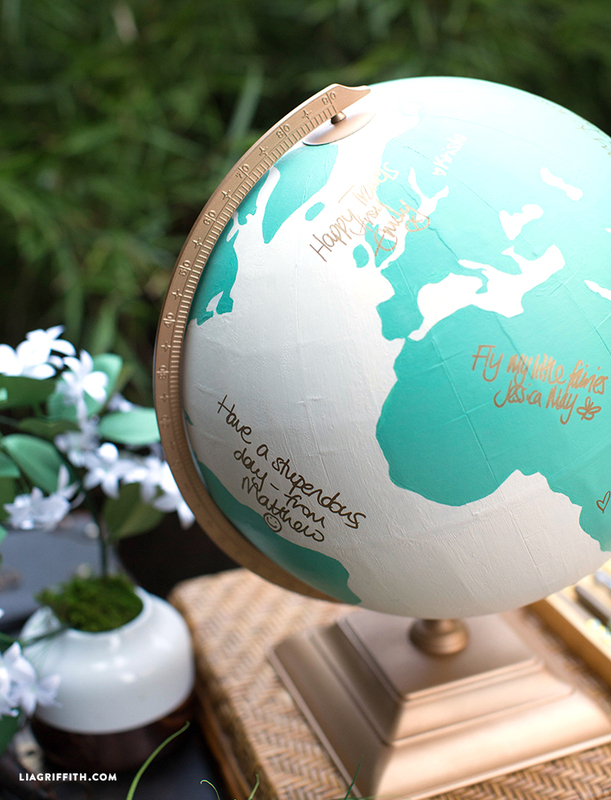 In eight simple steps, you can turn your globe into a guest book for your wedding. Just follow the tutorial below! 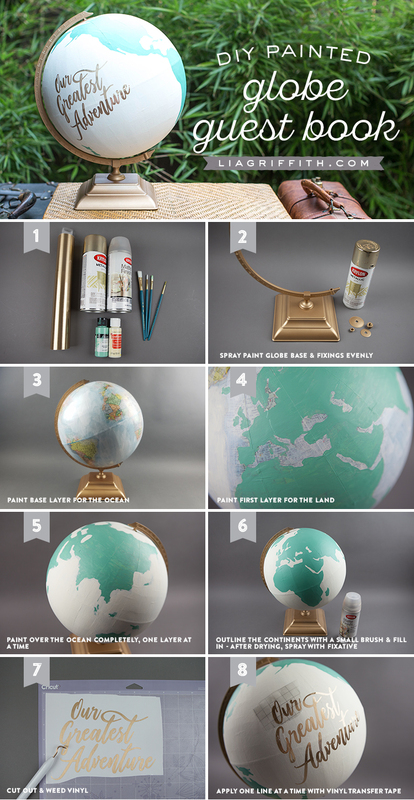 We’ve also included printable instructions with all the tools and materials listed—along with the decal you see on this globe guest book. Did you ever play that game where you spun the globe and wherever your finger landed was where you were going to go on your next trip? 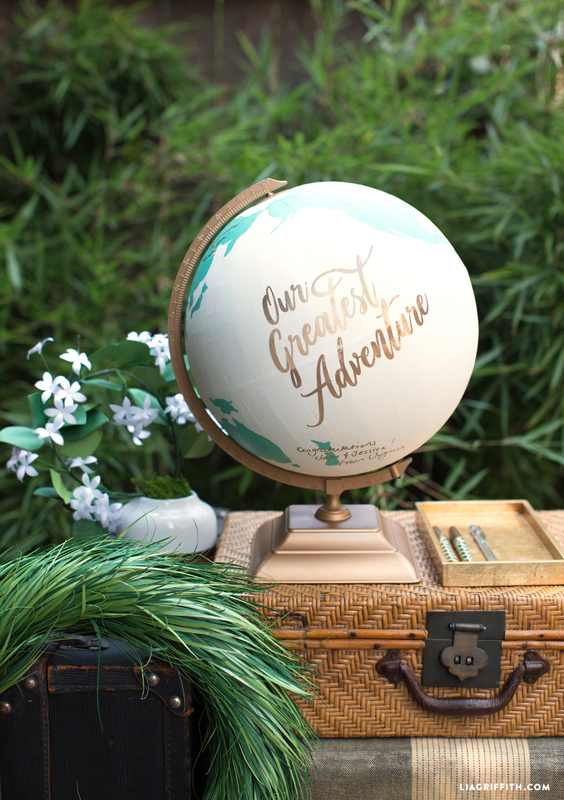 If you haven’t planned your honeymoon yet—and you’re feeling really adventurous—you can use this globe to help you decide! Hey! What kind of pen would you recommend when the guests are signing the globe? We used gold sharpie markers! Black would also work.